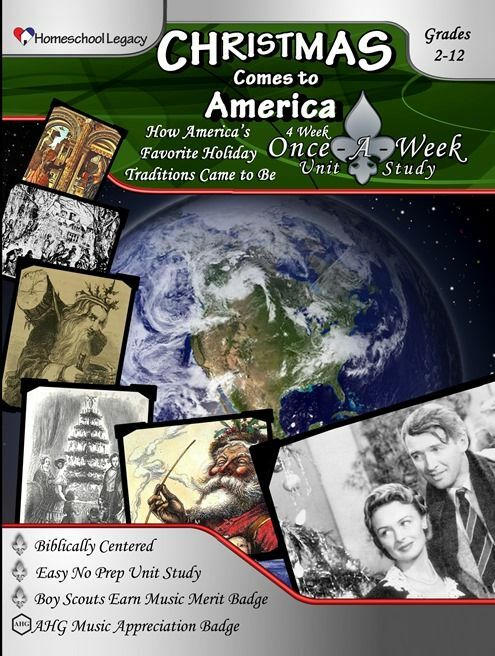 We were excited to work with Homeschool Legacy this holiday season with their Once-A-Week Unit Study Christmas Comes to America . I desired to go more indepth into the history of Christmas with the kids this year, and we really love doing unit studies. With our other school work, and obligations right now, it worked out wonderfully to use the Once-A-Week Unit Study so we could get through some of our prior engagements. I wasn't ready to tackle setting everything aside and jumping into Christmas full throttle in October. A perfect Once-A-Week Micro Study to jump into now is the Thanksgiving with the Pilgrims study. Using a unit study for Thanksgiving really helps your students get the most out of the holiday. Christmas Comes to America is a digital download with actual links within that you can click on. I did print out the book lists and activities for us to do, but didn't have to print the entire 45 page book. It is geared for grades 2-12 which worked perfectly for my crew ages 2nd grade through 12th grade! They had no qualms about jumping into a study on Christmas as they are actually in a play at the community theater called Elf Jr, and we have been in the Christmas mood since early October around here. This study looks at four different countries and some of their traditions that we have adopted in America. It includes the Dutch, The English, The German an American Christmas. The beauty of this unit study is that you can participate in a unit study without having to clear the rest of your schedule. Typically when we do unit studies, everything other than Math, all centers around the topic. Homeschool Legacy lets you have the best of both worlds. Homeschool Legacy is a bible based curriculum and incorporates it into each week with family devotional. It also includes science, geography, music, history, language arts and life skills. You choose one day a week as your unit study day. The other days of the week you keep your normal schedule, just add in some read aloud time from one of the books that go with the study. For us, we typically have a more relaxed day on Fridays, so this worked great for us to use as our unit study time. I was able to easily find the books that were recommended for the study at my local library. I was actually surprised that they had a majority of them being we live in a smaller town. There I also a list of choices for read alouds as well. Another option if you don't want to do it all in one day, is to take an hour each day and do a portion of the unit study. Because it is all laid out for you, and organized, it would not add any burden to your current schedule. My kids love to jump in with the unit studies so for us, Fridays worked just perfect. Through the different countries we were able to learn about St.Nicholas, Christmas Carols, Christmas Cards, Handel's Messiah, and other Christmas traditions. Much of what we learned springboarded from the unit study into the book suggestions. The Unit Study is a great basic, organized schedule for your to work with, and can always add more to it with the variety of books. We did have activities we chose to wait on, simply because we were reviewing it so early in the season. We plan to go and make the hot cocoa and give it out to friends, soon after Thanksgiving. One unique component of the Homeschool Legacy study is that corresponds with the Boy Scout and American Heritage Girls work toward merit badges. The suggestions for each is indicated with an symbol. See what the others on the Crew thought of these Unit Studies by clicking on the picture below.